A threat to our environment. Are very small, usually growing to only between 1 and 3 cm long. Have a hard bodied shell and upon reaching their adult stage, permanently attach to any hard surface in a water body and remain sessile for the rest of their lives. These hard surfaces include docks, watercraft, rocks, a grain of sand, water conveyance intakes and pipelines and even previous generations of adult mussels. Are prolific reproducers. Female mussels are able to release up to one million eggs per spawning event into the water column. The juvenile larval stage is microscopic and floats freely within water. It takes little time for multiple generations of mussels to establish and develop large colonies. Are filter feeders. Once they become established in a water body they feed on microscopic organisms competing with native fish and invertebrate species. Leave behind their attached shells when they die. Can survive up to 30 days out of water. 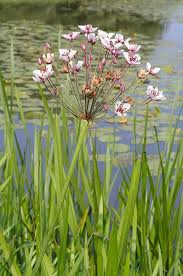 Flowering rush is a cat-tail like perennial plant which thrives in moist areas on the edge of water bodies or submerged in deeper water. It is able to reproduce by seed and vegetatively through rhizomatous bulblets which separate from parent plants. Once established it forms dense mats of vegetation choking out native vegetation and disrupting fish and wildlife habitat. It was likely introduced into Alberta as an ornamental garden plant. Flowering Rush is extremely difficult to control. Cutting and hand digging is feasible with small populations, however attempts must be made to remove all of the plant as any small piece of root fragment has the potential to regrow and start a new infestation. Cutting and hand digging must be ongoing until all traces of the plant is removed and regrowth does not appear which is usually very difficult to achieve. There is currently no chemical control measures to eradicate this invasive plant due to its growth within and in proximity to water bodies. Flowering Rush is present in a few lakes, rivers and reservoirs in Alberta. Prussian Carp (Carassius gibelio) a type of goldfish native to central Europe was first discovered in a single southern Alberta lake in 2006 and has now established breeding populations in water bodies through the Red Deer, Bow and South Saskatchewan river basins. We do not know how the fish was introduced. It is probable that it was released through an aquarium or backyard pond dumping or through contaminated bait. Prussian Carp are hardy and reproduce rapidly. They are adaptable and able to live in aquatic environments with low oxygen levels, such as dugouts, and are tolerant of pollutants. They can also survive out of water for relatively long periods of time. Females are able to reproduce one to two years into their lifespan and can spawn up to three times per year. Prussian Carp threaten native fish populations by competing with native fish species for food and habitat. Should you catch a Prussian Carp while angling, please kill it and either take it home to eat or properly dispose the carcass away from any water bodies. The EID is collaborating with other irrigation districts and the Government of Alberta in support of the fight against the introduction and establishment of aquatic invasive species (AIS) into Alberta’s water bodies. An invasive species is an organism not native to an area or particular ecosystem which when introduced, establishes readily and alters the ecosystem almost always with negative results. Invasive species generally compete with native species for resources and ultimately impact these species. Aquatic invasive species establish and alter aquatic ecosystems such as lakes, rivers, reservoirs and wetlands. All aquatic invasive species pose a threat to the management and operation of irrigation conveyance infrastructure, including reservoirs, and to the health of the Province’s natural lakes, rivers and wetlands. Most aquatic invasive species are spread from one water body to another through transportation of trailered watercraft infested with the invasive organism. Some aquatic invasive species may also be introduced by individuals dumping fish and/or plants from household aquariums or backyard ponds in Alberta water bodies. Aquatic invasive species of most concern in Southern Alberta currently include Zebra Mussels (Dreissena polymorpha), Quagga Mussels (Dreissena rostiformis bugensis), Flowering Rush (Butomus umbellatus) and Prussian Carp (Carassius gibelio). What can you do to prevent the establishment and spread of aquatic invasive species into Alberta’s water bodies? If you are entering the Province with trailered watercraft, including motorized boat, canoe or kayak, stop for an inspection at an inspection site. If you do not pass an inspection site you can call the Provincial AIS hotline at 1-855-336-BOAT (2628) to arrange for an inspection. Always CLEAN-DRAIN-DRY your watercraft when removing it from any water body. This will minimize the potential of transporting any species from one water body to another water body. CLEAN = remove all plants, animals and mud at the access area or dock. DRAIN = drain all water from bait buckets, coolers, live well, bilge, ballasts, transom motor and internal compartments before leaving the water body. DRY = dry watercraft and gear, including fishing equipment and water sports equipment completely between trips. Gear may be disinfected in a 2% bleach solution for 1 minute (20 ml of bleach per 1 liter of water). Allow wet areas of your boat to air dry. Leave compartments open and sponge out standing water. Report any suspected invasive species by calling the Provincial AIS hotline at 1-855-336-BOAT (2628). Do not dump fish, plants or invertebrates from household aquariums or backyard ponds into any Alberta water body. When planning a backyard pond development use only native vegetation. Know which aquatic plants are not native and/or invasive. A good resource is the Alberta Invasive Species Council website at www.abinvasives.ca. Do not move live fish from one water body to another and do not use live bait when fishing. In Alberta it is illegal to do either and penalties apply. 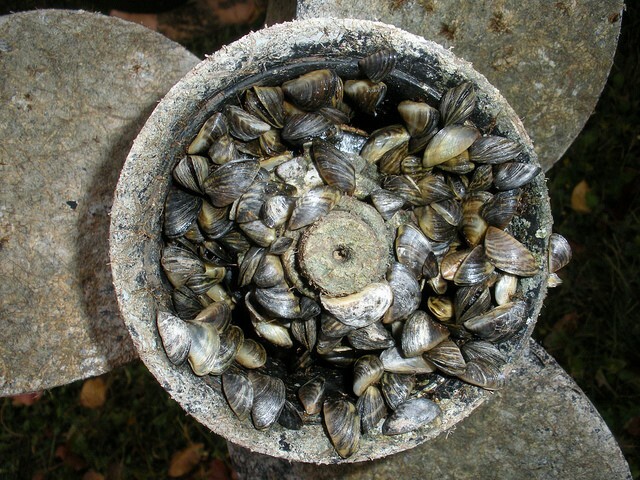 Though not currently present in Alberta water bodies, Zebra (Dreissena polymorpha) and Quagga (Dreissena rostiformis bugensis) mussels are aquatic invasive species that are of particular concern for a number of reasons. Most of Alberta’s water bodies are considered high risk for zebra and quagga mussel establishment as the chemical and physical properties of the water bodies make them a favored habitat for these mussels. Should mussels be introduced into Alberta water bodies they will establish rapidly and quickly change the ecosystem by competing with native organisms for food, and developing large, sessile colonies. These effects will be devastating to the ecology and recreational enjoyment of water bodies. Native to the Black Sea region of Europe, it is suspected these species “hitchhiked” to North America within the bilge water of trans-ocean vessels. The mussels were first identified in eastern Canada and eastern United States (the Great Lakes area) in the late 1980’s and have established and spread throughout most of the continental US and in Canada as far west as Manitoba. Due to their physiology mussels are extremely effective at catching a “ride” on watercraft from an infested water body and being transported and introduced to a non-infested water body. They are small and are able to attach to the numerous small crevices and cracks found within watercraft and because of this are sometimes not even visible upon observation. Adult mussels can survive for up to 30 days out of water given the right temperature and humidity levels and the microscopic larvae of mussels can survive within water in bilges and live wells for a number of days. Given this, it is easy to see that an infected boat transported to a different water body may easily infect the new water body without the owner even realizing the watercraft is infected. Once established in a water body or water conveyance system such as irrigation pipes or potable water intakes mussels are almost impossible to eradicate. There are currently no approved chemical control options for use in Alberta water bodies at this time. Mechanical control options to remove established mussels from structures will be laborious, ongoing and costly. The Government of Alberta estimates the overall cost of mussel establishment to taxpayers within the province will be close to 75 million dollars per year. These costs not only include maintenance costs to remove mussel shells from infrastructure but also lost recreation days and individual maintenance and replacement costs for watercraft owners. The Southern Alberta Irrigation Districts, including the Eastern Irrigation District, are especially concerned with zebra and quagga mussels and have collaborated on a number of projects to help prevent the establishment of mussels into Alberta. Through the Alberta Irrigation Projects Association (AIPA), southern Alberta’s irrigation industry association, a trial Mussel Dog Detector Inspection Program was brought to Alberta during the spring of 2014 and 2015. Dogs trained to target mussels by scent were deployed at Alberta Transportation Weigh Scale sites to efficiently and effectively search high risk trailered watercraft travelling into Alberta for mussel infestation. The program proved such a success that in 2015 the Eastern, Bow River, Taber, Lethbridge Northern, Raymond, United and Western Irrigation Districts funded the training of four Mussel Detector Dog teams (handler/dog) for permanent deployment within the Province’s AIS inspection program. To date three teams have been trained and deployed at inspections stations through Alberta. The fourth team will be trained and deployed in early spring 2016. In March of 2015, the Government of Alberta announced mandatory inspection of all trailered watercraft entering into Alberta from any other Province or State. AIS inspection stations are established at most Alberta Transportation Weigh Scale Stations. Additionally, roving inspection teams visit numerous boat launches throughout Alberta inspecting watercraft and educating users on the mandatory inspection legislation and the risks of aquatic invasive species to Alberta. The Eastern Irrigation District will continue to support the Province by assisting with education and outreach at the Rolling Hills Reservoir Campground and through numerous presentations and display opportunities throughout the year.